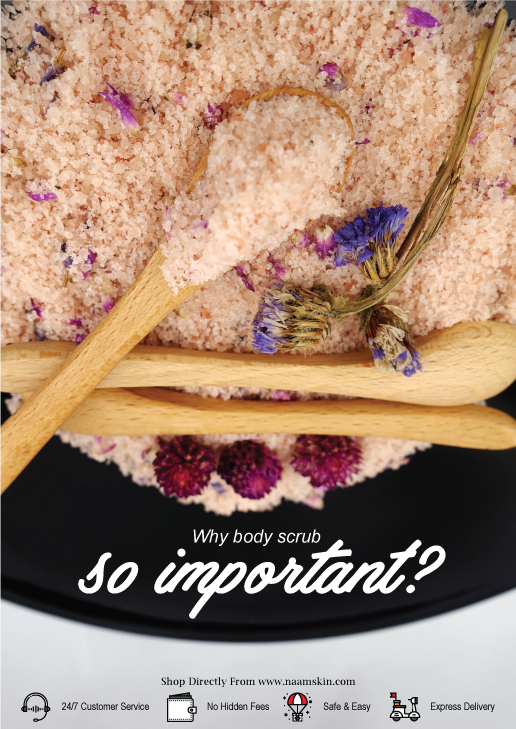 Why Body Scrub So Important? Our skin is constantly changing and skin cells renew each day. Our skin repairs and rejuvenates every 30 days when we are young. As we age, the regeneration process somehow slows down, and the skin accumulates dead surface skin cells. When the skin matures, its natural ability to shed old dead skin cells and transform itself significantly reduces. This causes a buildup of dry skin flakes and gives the skin a dull, rough or lackluster appearance. The process of exfoliation is therefore important to allow your skin to “breathe. No matter what scent you love - fruit, nuts, or sweet sugar - there is an exfoliating body scrub for you. We all know this skin care product exists, but many of us don't take the time to use them. We could go on about but let's start with a little known fact that might just make exfoliating a no-brainer. Scrubs help to “buff and polish' the skin to reveal smoother, softer and youthful looking skin. encourage the removal of toxins, dirt and oils, by unclogging skin pores. When skin pores are unclogged, this allows the skin to effectively absorb nourishing and moisturising products. Body scrubs are generally very affordable products. Popular ingredients in body scrubs include, oats, coconut oil, flower petals, and coffee grounds. All do an excellent job of smoothing and moisturizing skin in one product.